At a recent lunch with friends, one of them asked if I missed the security and simplicity of a 9-to-5 job. Wasn’t I scared? The truth is yes. Oh yes, I am scared. Scared every day. I feel, a bit, as the neanderthal in the jungle must have felt thousands of years ago. Each time the neanderthal woke up to go hunting, he was alive, engaged in the moment. He may have gone hungry, he may lose in battle to a large animal, or perhaps, captured the tiger and fed for a month. As long as the neanderthal is living, though, he is living free. I feel more … alive running Excelon Development than I can remember in my professional life. But scared? Certainly. Running a small consulting business is scary. 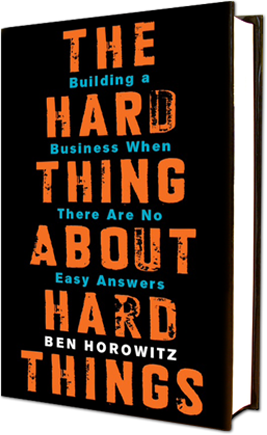 So when I heard that Ben Horowitz, a founder at Netscape (and multiple other companies) had a book out on entrepreneurship titled “The Hard Thing About Hard Things“, I was intrigued. When I realized the subtitle was “Building a Business When There Are No Easy Answers”, I immediately purchased the book and read it in one sitting. The most obvious lesson in the book isn’t quite what I expected, though. While Horowitz can be candid talking to line employees and managers, “shooting from the hip”, he recommends caution when dealing with executives. In one example, he talks about CFO asking for advice on how to move to the COO’s office, telling a time that he gave the standard advice – increase your scope of responsibilities, get an understanding on the business as a whole, and so on. Within a few days, he got phone calls that Horowitz was grooming the CFO to do the COO’s job one day, and he had gone recruiting, asking internal employees if they would transfer to work for him! If you look at it from a certain angle, the CFO’s actions make sense. Why, he was “just” following the CEO’s intent, right? All he had to know was how to interpret the words in the best possible light, and what to do with that information. Put a little more cynically: Executives know how to use words to their advantage. That is how they got to be executives. Horowitz goes so far as to suggest that when an executive brings a complaint about another executive, you say nothing, because you can’t win. If you agree the other executive is a problem, the complainer can now spread the rumor with your blessing. Worse, they can say that you know about the problem and haven’t done anything! If you disagree, then you are “out of touch.” His suggestion to deal with the situation is to shut down the complaint, immediately, disagreeing with the claim. After that, he suggests you conduct your own assessment of the person in question, free from the bias of the original claim, free from even knowing the details of the original complain. Horowitz is saying that “highly ambitious, more seasoned professionals” know what to say, how to say it, and how to listen to get the outcomes they want, and need to be treated differently. The implied reason to put up with this is that the sales VP who knows what to say will also know how to bring in accounts and train sales staff to do the same — you want that in an executive. Which leads me to think about the larger group of people toward the bottom of the pyramid, the line employees and managers just trying to do a good job. Without refined social skills, they walk into the boxing ring (I mean, um, meeting) and act naturally, they’ll be pummeled by the more professional boxers, I mean, um, IT Leaders. And keep it tuned here. Somehow, I think we aren’t done with this topic yet.